Oh good lord. Are MAFEX 6″ Star Wars figures coming? Image from CollectionDX. Example of a MAFEX figure here. While I love Star Wars Black, if the first figure is Vader or Boba Fett, I don’t see how I can possibly not get it. I'll add "What the hell is MAFEX?" to my get-off-my-yard! list of things that make me feel old and unhip. Oh, I hadn't heard of it either. It's more the novelty of there being another 6" Star Wars line out there after three and a half decades of nothing but 3.75" and 12". Since Hasbro’s going to make a Darth Vader eventually, I’d rather have a super-articulated Grievous or another character that wasn’t on the leaked lists. 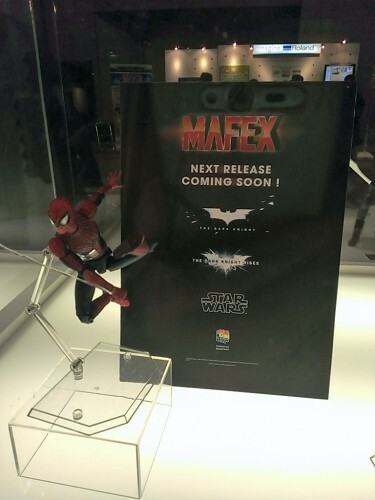 I think MAFEX is a S.H. Figuarts competitor line. At least that's what I get from the image of that super-articulated Spider-man figure. I have the MAFEX Batman, its at the $40 price range, its a nice figure but it falls apart to easily. They only had like 2 other figures prior to this.